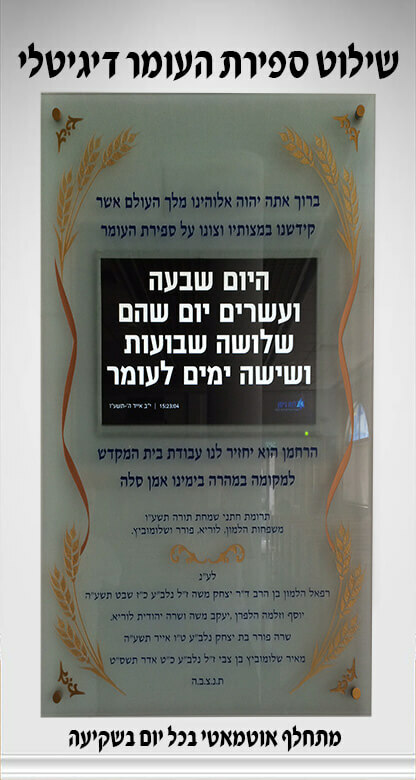 Luach Nissan – digital signage for synagogue the most advanced in the world! 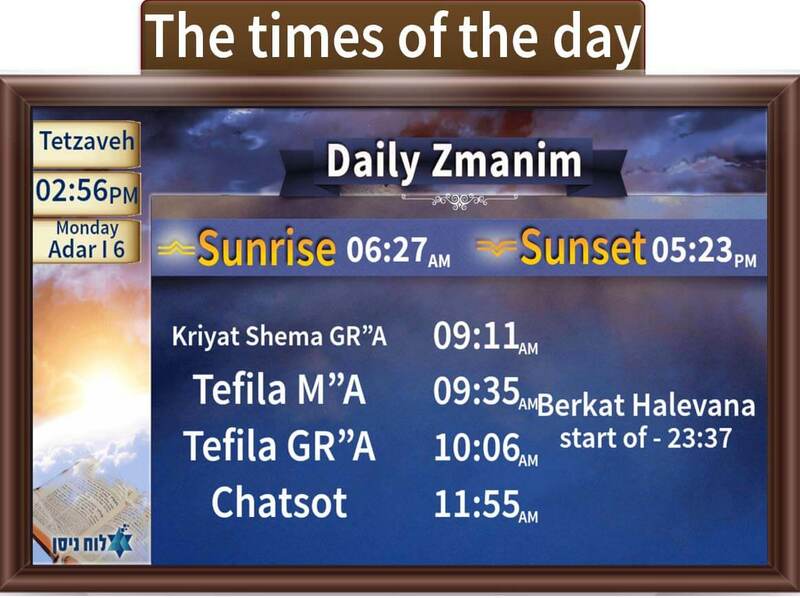 Setting regular prayer times and times according to the time of the day such as sunrise, sunset, etc. 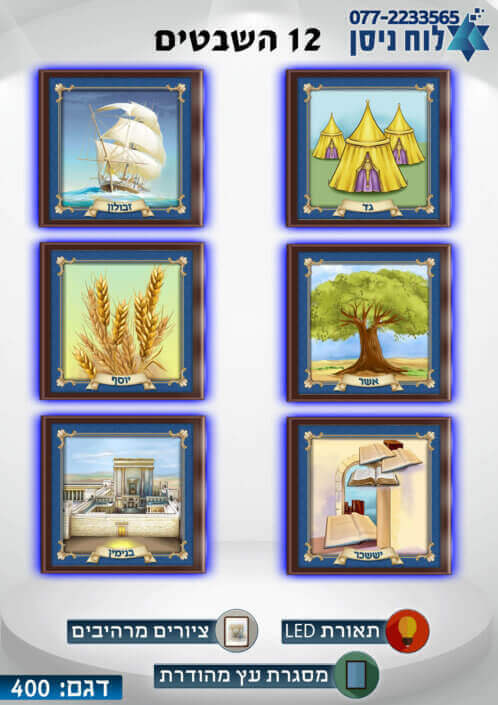 In addition, the times can be set according to the winter and summer time. 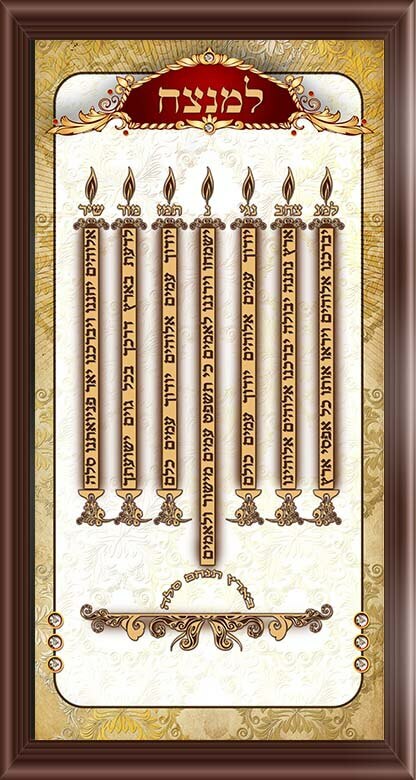 Insertion of the board – unlimited! 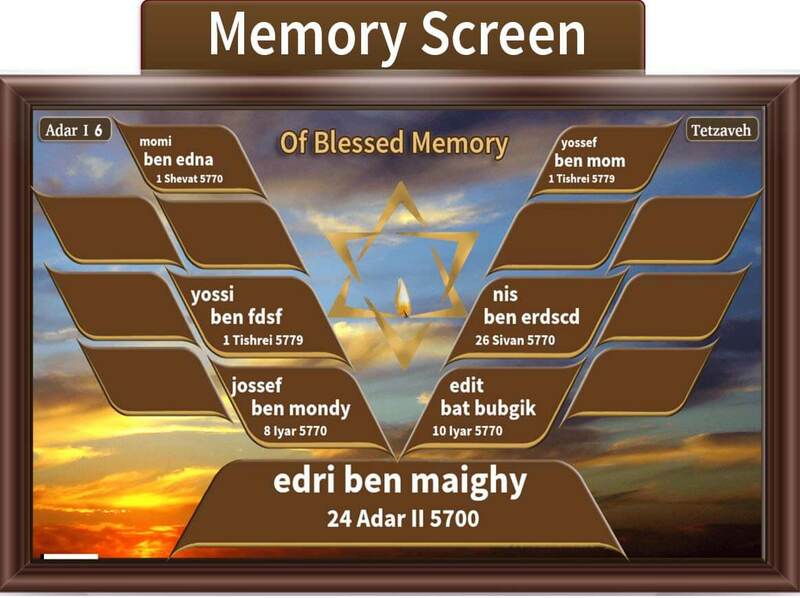 The five discontinued who demise dates are very close to today’s date are shown on the calendar regularly. Beside the declined names appear a sign of: the year of demise, the month of demise, the week of demise, the day of demise. 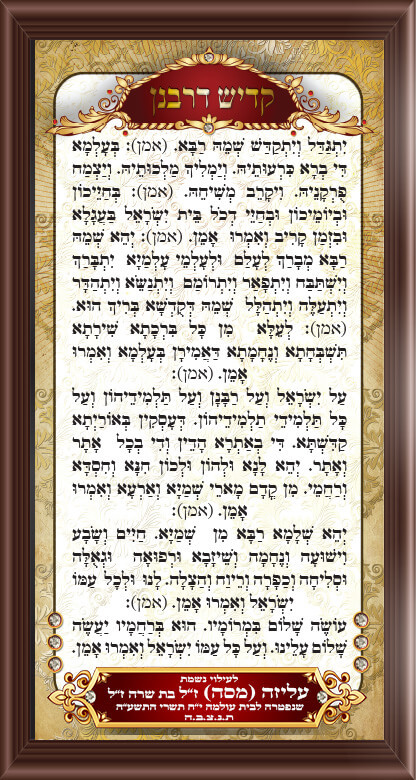 Presentation of changes in prayer such as: Barech Alenu, Morid Atal, etc. 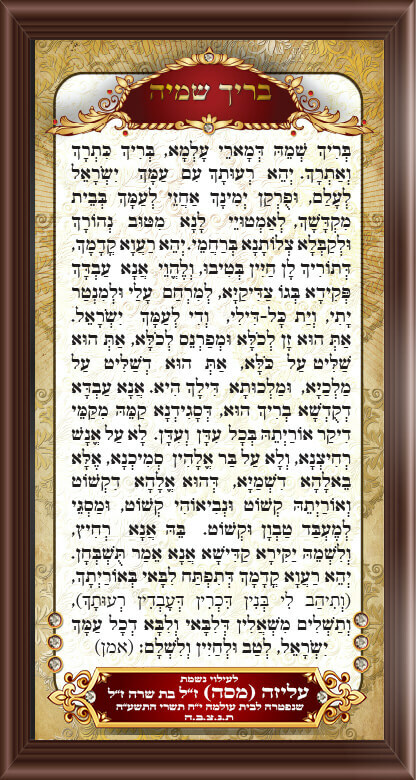 Presentation of Tosafot in prayer, such as: Yale Yavo, Al Ahanisim and etc. 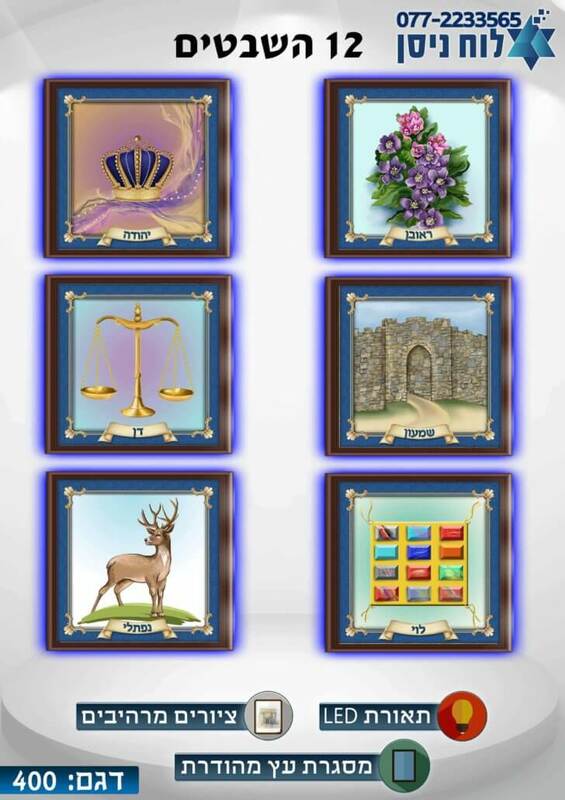 Parshiot of the week and haftarot according to the different customs: Sfardi, Ashkenaz, Sfard, Tamani Baldi, Tamani Shami. 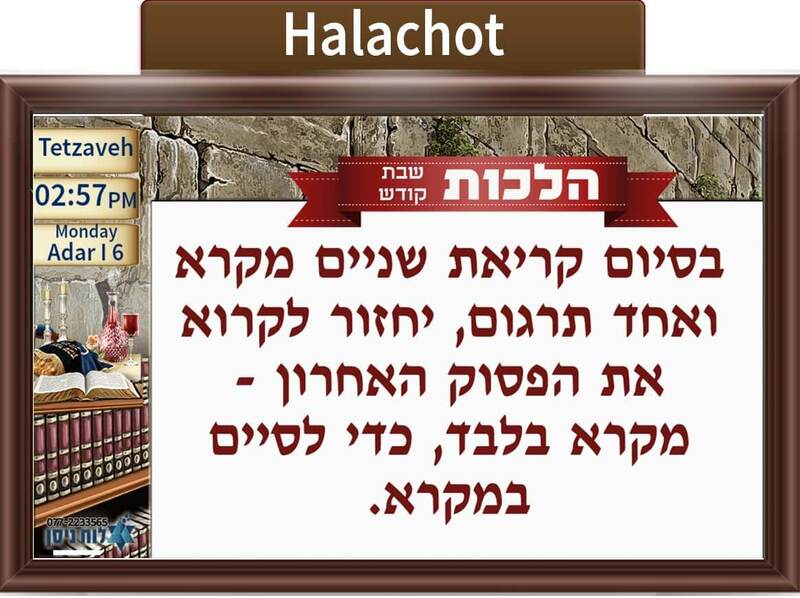 Daily Halachah from a selection of books on various subjects in easy and clear language. 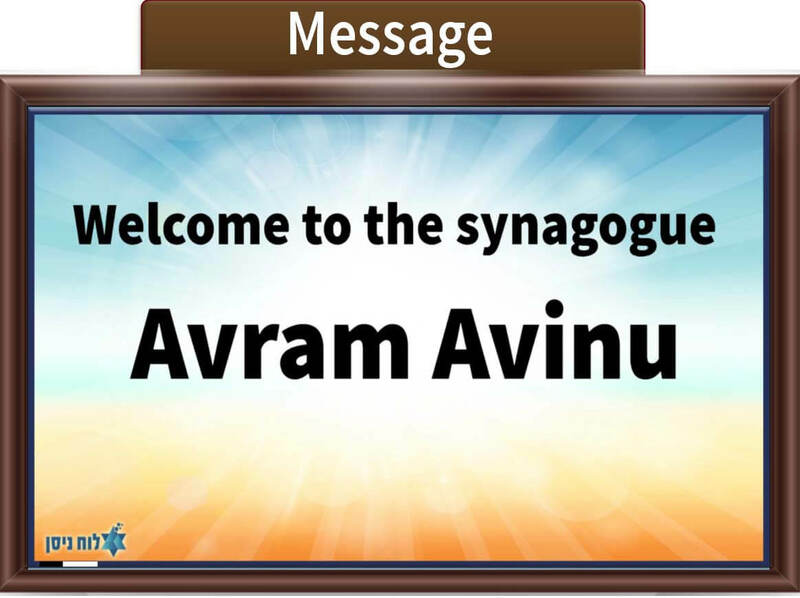 Advanced editing software for writing messages! 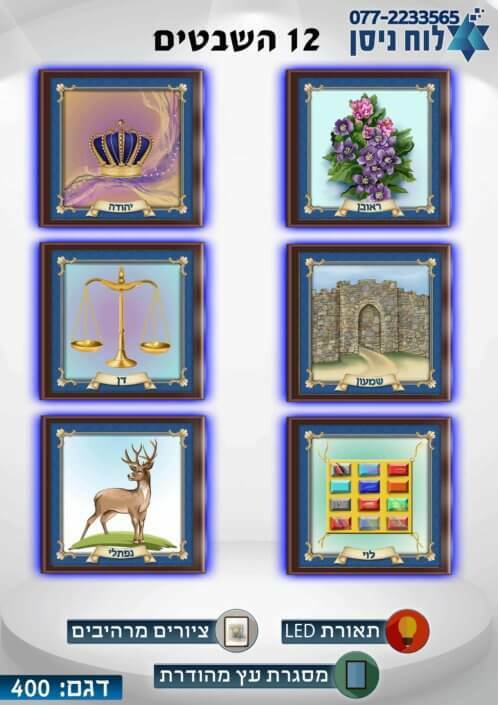 You can also add photos from a personal database. 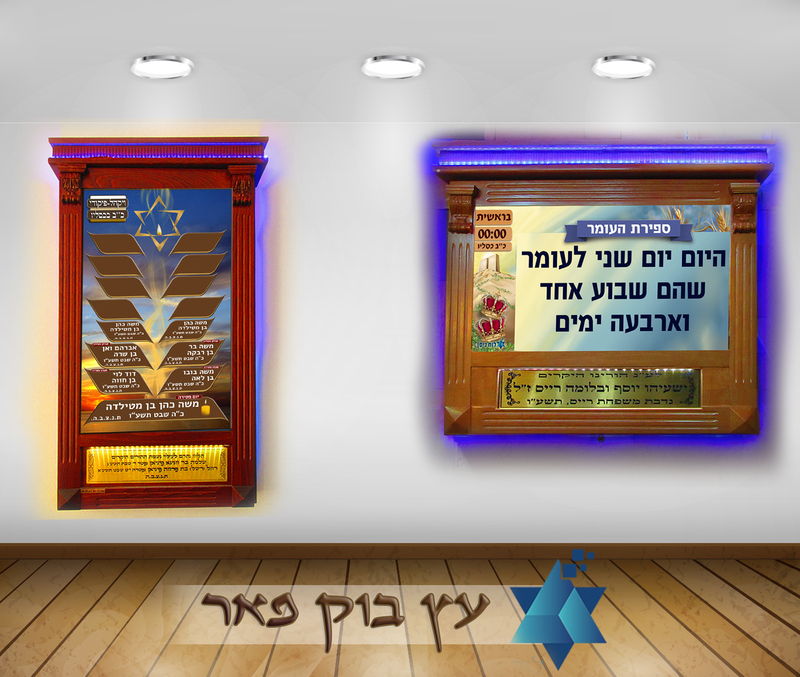 Large selection of fonts in different colors. 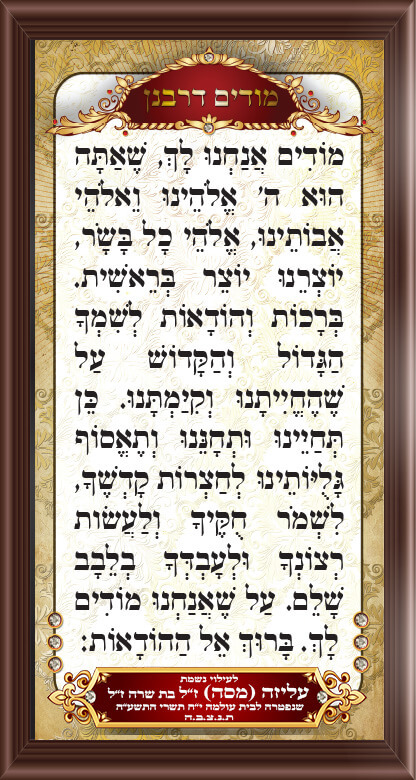 ברצוני להגיד תודה על שירות אדיב, מדוייק והכי חשוב מקצועי! 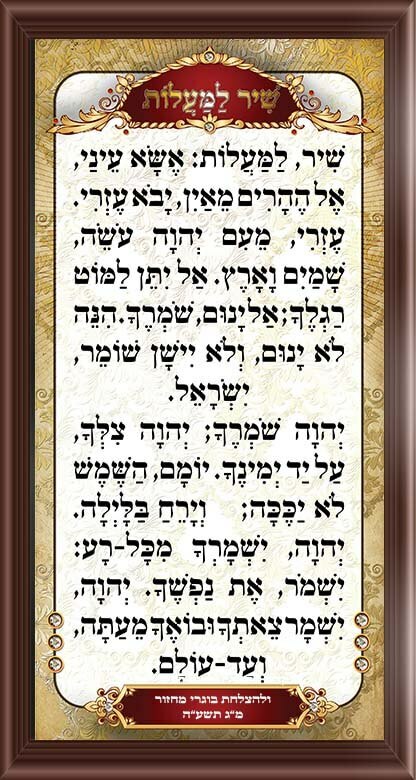 על תמיכה תכנית מראשית התהליך וכל יום יום! 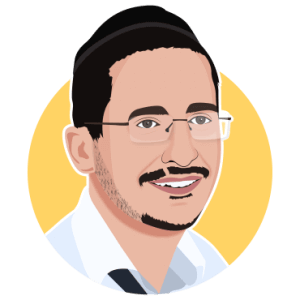 תוכנה מצויינת ממשק נוח, קל לתפעול, ואפליקציה מדהימה ששוחפת את כל קהל המתפללים! 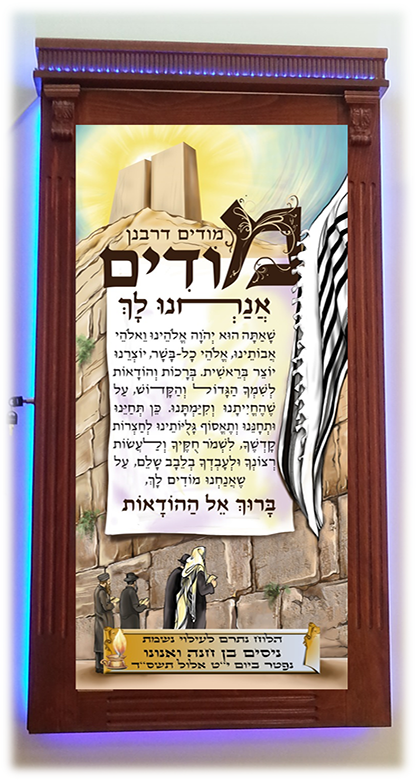 לכל מי שיש אפילו התלבטות הכי קלה, אל תחשבו פעמיים! 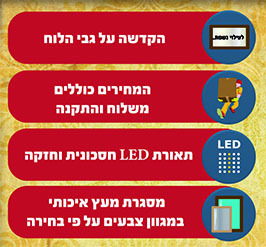 לוח ניסן הפרימיום שבאפליקציות לבתי הכנסת. 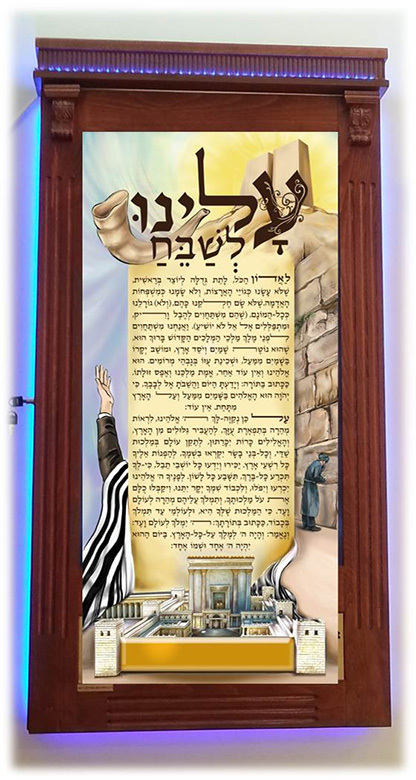 עלו והצליחו והמשיכו להפיץ אור ולזכות את הרבים! 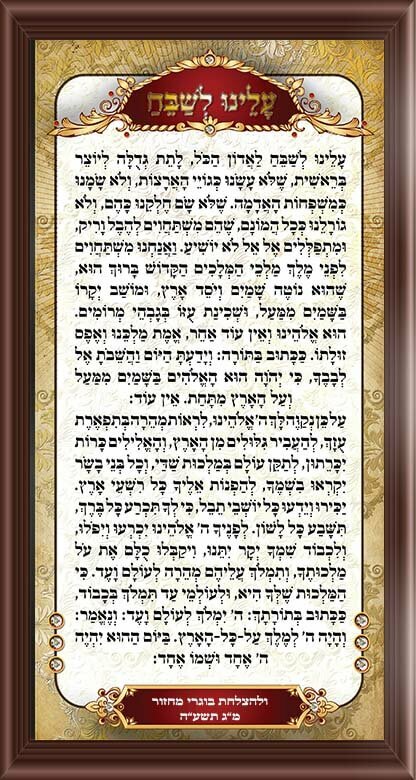 שליח מטעם איגוד הרבנים ליוצאי יהדות גאורגיה בחולון. 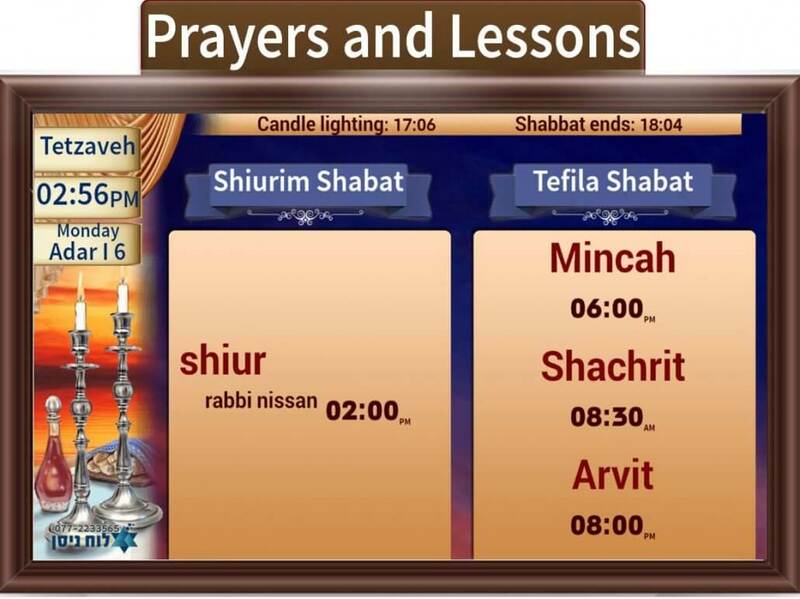 Presents prayer times and shiurim, Shabbat candle lighting time, Messages, Memory of the deceased, Halachah Yomit, times of the day. 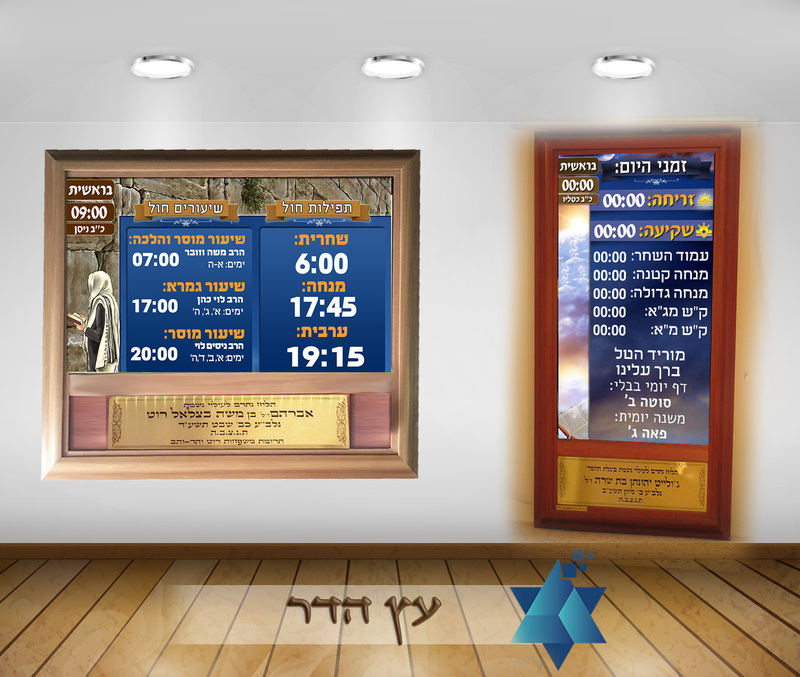 All the information on the computerized digital screen in the synagogue is also available in the app in a convenient and easy way! 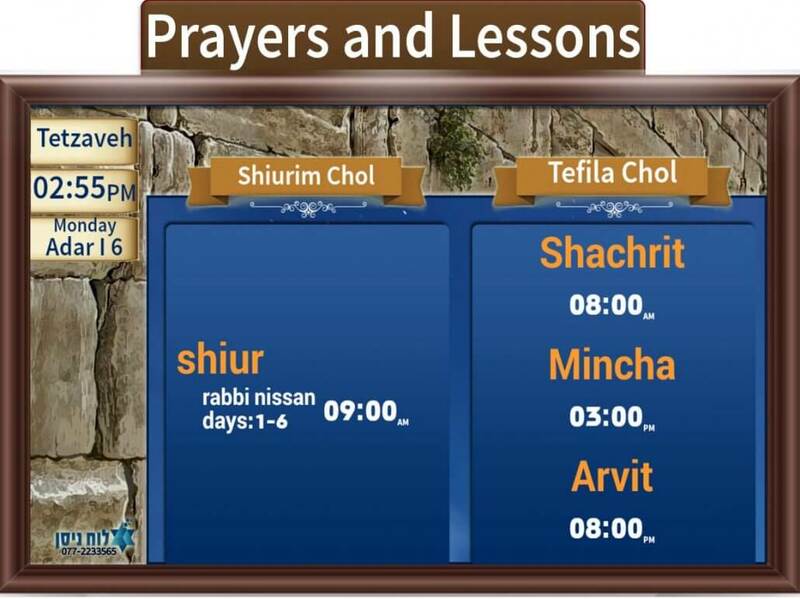 The Nissan Calendar (“Luach Nissan”) uses advanced technology to strengthen the connection between members of the synagogue community. 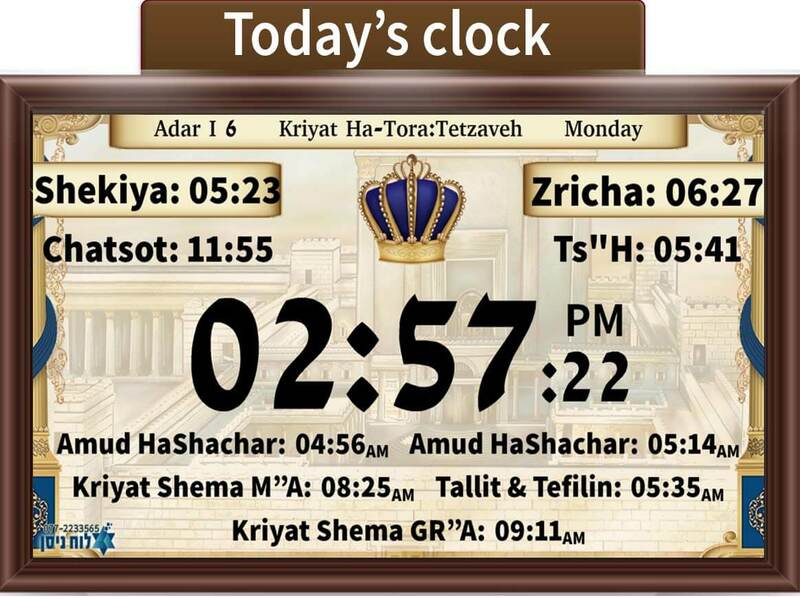 The calendar is now integrated into dozens of synagogues in Israel and abroad. The first version of the board was marketed in 2009 and since then has been improved to an unknown level. 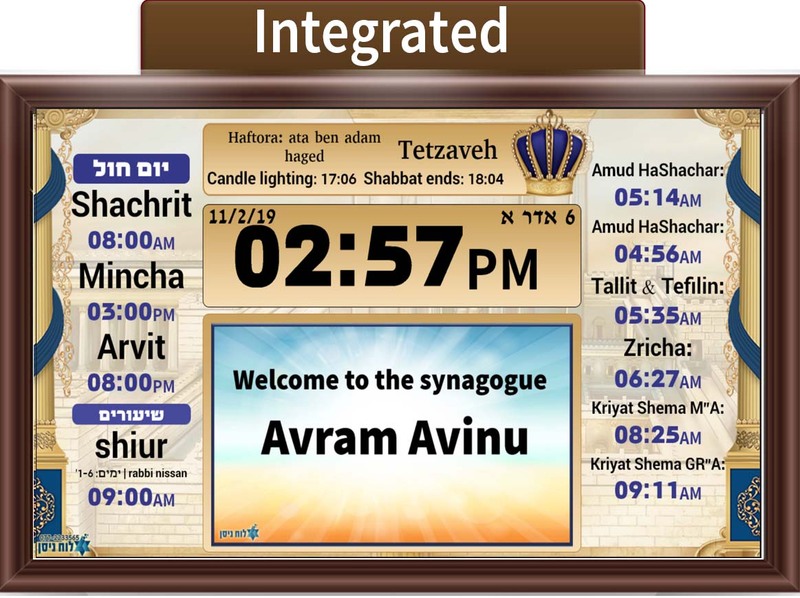 The latest version of the tablet is based on an Android device, including many additions for the benefit of worshipers and gabai, such as remote control of the board from any location, personal application for each synagogue and more. 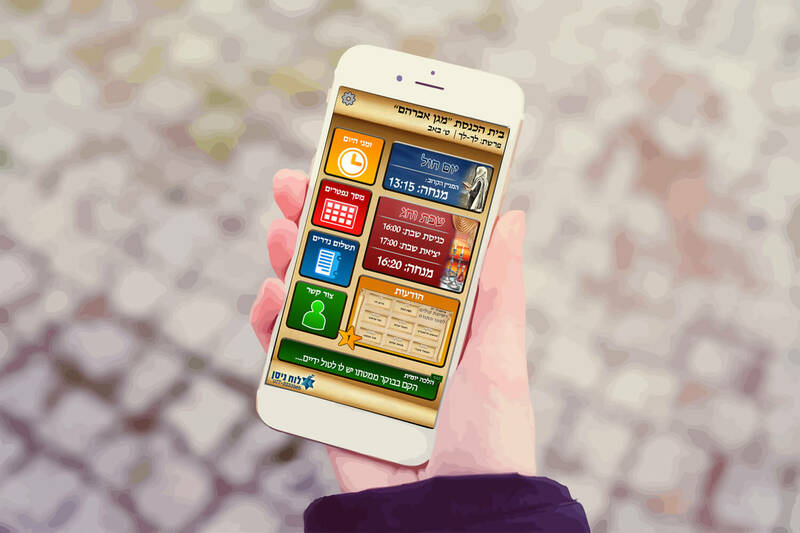 We recently developed a new system for Alzheimer’s patients, which allows the patient to find out what day, day, and date it is.